Peyton was just fascinated with the Olympics this summer. She could not get enough of watching the women’s gymnastic meets. We are also big soccer fans in our home so we caught most of the soccer matches too! In Caillou Goes for the Gold, we get to see Caillou learn some new sports. Caillou learns about soccer, basketball, karate, running and more. He learns that nothing is as easy as it looks. There are 11 episodes! That’s about 60 minutes of Caillou having fun while learning new sports. When Clementine shows up with a swimming ribbon on her chest, Caillou really wants to have one too. Grandma comes up with some very silly games with ribbons for prizes. Caillou imagines he’s an athlete and has a lot of fun trying his best. He finally does win a ribbon in the straight face contest! Caillou’s big friend André has come to visit. André’s a soccer player and Caillou wants to play too, only Caillou isn’t very good at kicking the ball. Sometimes he misses altogether; sometimes it only goes a few inches. He wants to give up, but André and Dad encourage him and eventually he makes the biggest kick of the day. Caillou goes with Mom to buy a new pair of shoes. On the way he sees Sarah running fast. He decides he wants a pair of shoes he can run in. First, the salesman has to measure his feet. Eventually, he picks exactly the right pair and he shows Sarah just how fast he can run. Caillou goes to the swimming pool with his family and Daddy teaches him how to swim. After a few lessons he’s getting better and better. Pretty soon, he wants to swim by himself and although it starts off with a bit of a scare, everything ends up just fine. Caillou can swim now. When Caillou notices that Dad and Grandpa are captivated by a baseball game on TV, he wants to get in on the excitement. Dad and Grandpa are eager to teach Caillou how to play the game. At first, Caillou’s discouraged by how difficult it is, but lots of practice and some good coaching from Dad and Grandpa make it a little easier for him. The end result? A backyard baseball game with the whole family and Mr. Hinkly joining in on the fun. Leo comes over to play at Caillou’s house. They have fun pretending to be bears until Sarah shows up wearing a gi (white Karate outfit). Dad had promised to drive her to her Karate lesson. Sarah introduces Caillou and Leo to Karate and demonstrates a few moves. While she is at her class, the boys have their own pretend Karate game. When Sarah comes back, she gives another lesson to the whole family. Caillou gets a special invitation to go to André’s gym class. 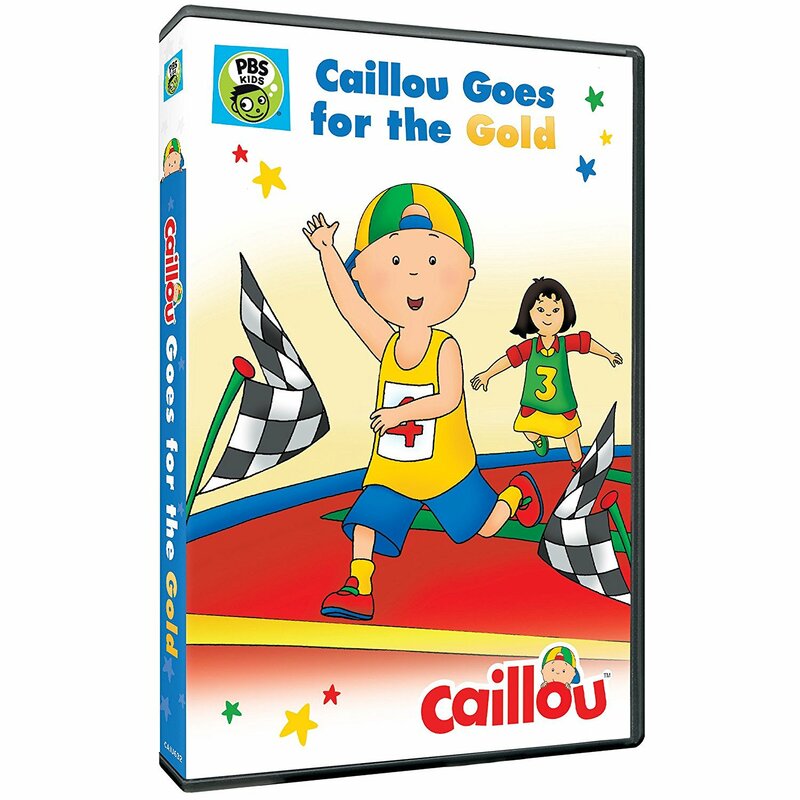 A little intimidated at first, Caillou tries his best and ends up having great fun. When they make a rhythmic coordination exercise, Caillou discovers that not everything is easy! Caillou finds the leap-frog exercise difficult but he keeps trying and finally succeeds. Back home, André and Caillou play gym class and when Caillou finds a toy whistle, it’s his turn to be the gym teacher! When Caillou and Rosie stay at Grandma and Grandpa’s house, Grandpa uses pop bottles and a rubber ball to create a kid’s bowling alley in the backyard. Grandpa teaches Caillou to bowl, but when he is called inside, it’s Caillou’s turn to teach as he shows Rosie how to play. Rosie and Caillou have a great time playing together and when they come in for a snack they have another surprise: Grandma has made a little bowling trophy for each of them. Caillou is excited when Miss Martin takes him and his friends to the park for some special activities. They have a beanbag race: a relay race using one beanbag per team. All these rules are not easy to grasp, and the kids have a few comical mishaps in the process. Caillou discovers that you don’t always have to win to be proud of yourself. Caillou wants to run a marathon, just like Daddy. His father explains that marathons are for grown-ups, but Caillou insists he can do it! Caillou and Daddy go running together, and Caillou discovers it’s harder than it looks. When he sees Rosie dawdling along, Caillou realizes that everyone runs at their own speed and ability – and he decides to run a mini-marathon instead! Caillou is hesitant to try bowling, until he gets to the bowling alley and sees how much fun his friend, Sarah, is having while bowling. Caillou gives it a try…and he likes it! That’s a lot of adventures! Peyton really enjoyed watching Caillou. You can pick up a copy of Caillou online or at your local store.